The Asia Hotel is the most modern and luxurious hotel along the Monivong Boulevard, which is the main economic spot of the city. With the perfect location in the heart of Phnom Penh and it is near the Central Market (Phsar Thmey) while other modern stores and super markets are just next and a few steps of walk that you can enjoy with the great shopping centers. 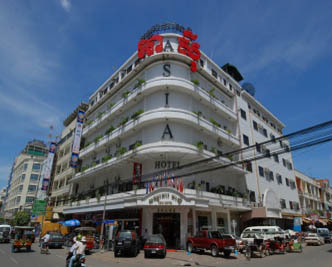 Also the Asia Hotel is just very short drive to major interesting places as Royal Palace, National Museum, Wat Phnom, Independence Monument and Toul Sleng Genocide Museum. The newly established Asia Hotel is offering the first class services by our friendly efficient staffs and the room’ stay more comfortable. Asia Hotel in larger map.